Dessert for breakfast! Breakfast for dessert! Reese’s cup flavored everything! Should have led with Reese’s cup flavored everything. Happy Monday! We’re starting with chocolate. And why not, really? 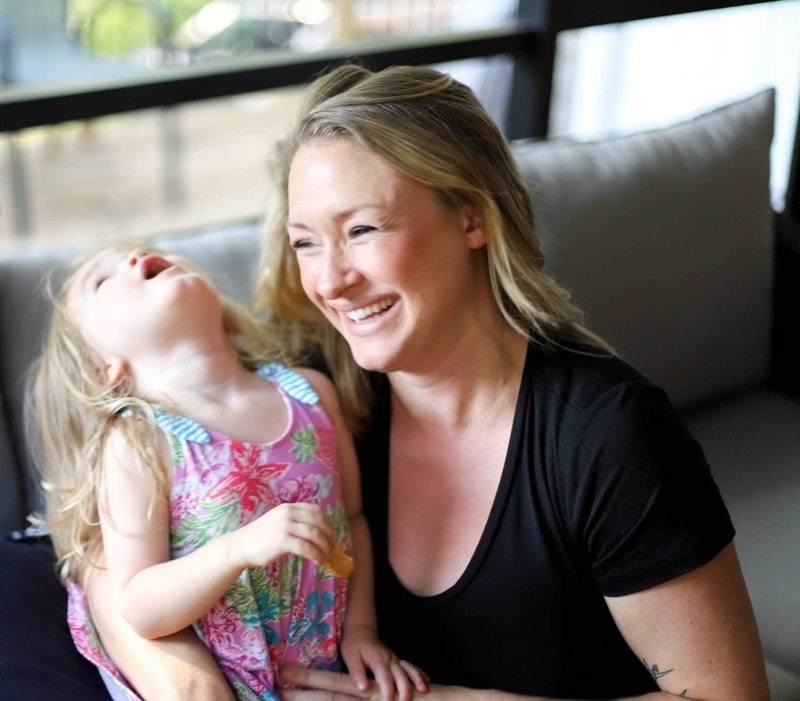 There is a perception that chocolate is always unhealthy, but I think it’s more that when cocoa powder is served with sugar + fat + carbs we run into issues. 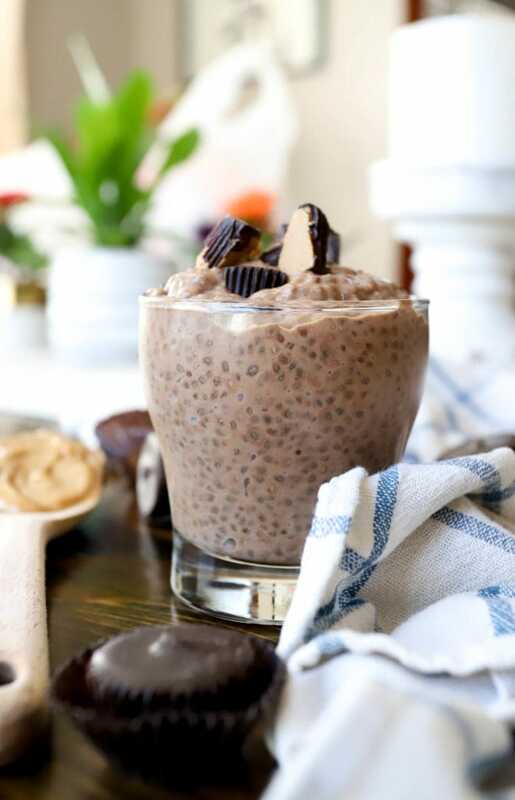 This has those things, certainly, but it also has chia seeds, peanut butter, honey instead of sugar (still acts like sugar, though, don’t be totally fooled), and dairy that can be lower in fat if you choose. You can also sub the milk + cream for coconut milk and/or almond milk if you’re dairy-free, so lots of options here! The point is more that things called pudding can definitely be good for breakfast or snacks or dessert. 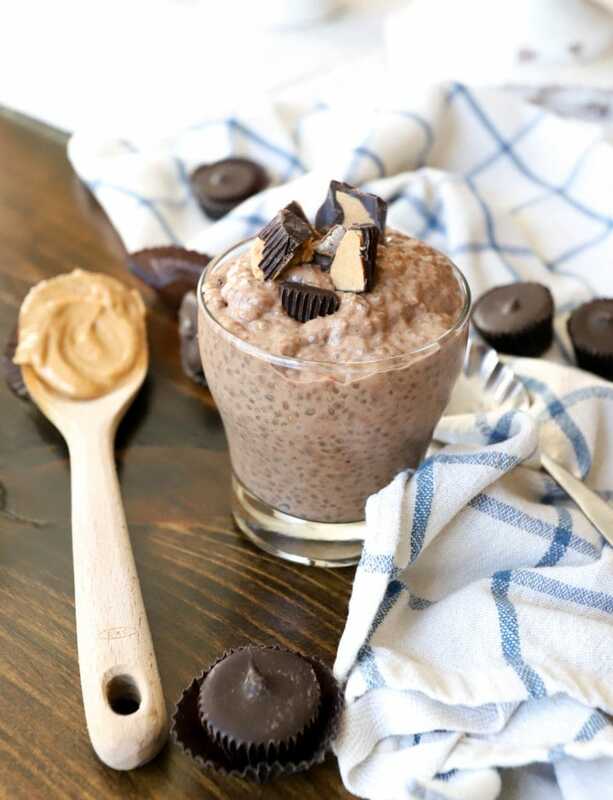 Chia pudding in particular is so easy to make, and I don’t know many people who dislike the chocolate+peanut butter combination, seriously. 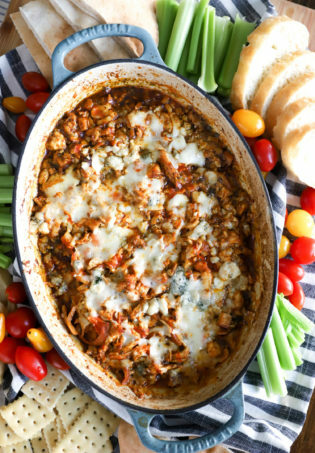 I love making a big batch like this while something else is cooking (because it takes all of 5 minutes), then keeping it in the fridge for several days to grab when we need something fast. 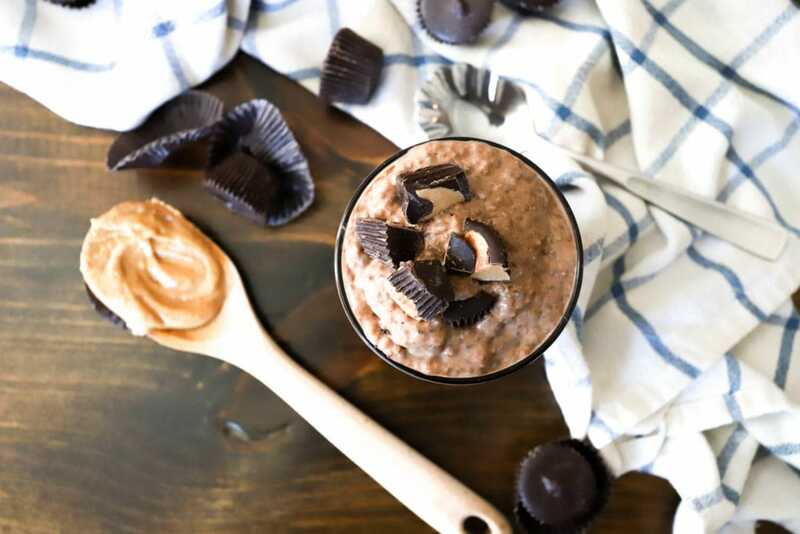 This version has slightly more liquid than other variations for a creamier effect, and I DID throw some peanut butter cups on top for a visual (and because they are delicious, obviously) and to up the dessert-factor of these. 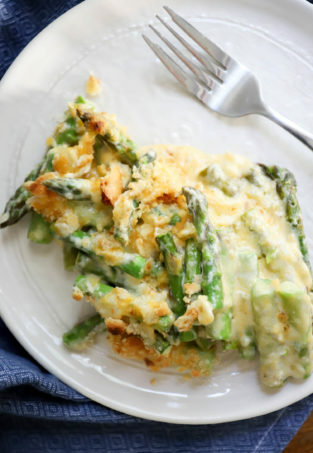 Maybe leave them off if you make this for breakfast, maybe don’t. 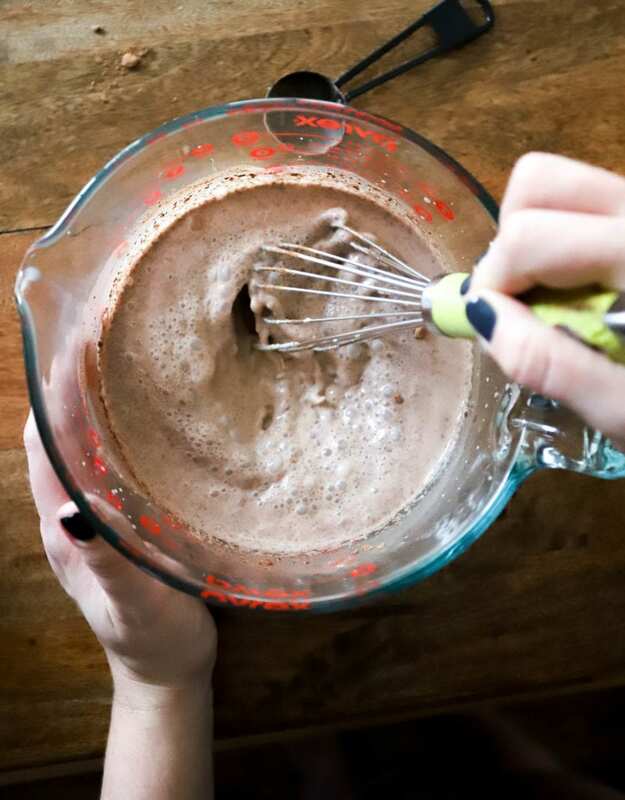 For the pudding itself, you need milk, heavy cream, cocoa powder, peanut butter, honey, and chia seeds. Again, feel free to sub the milk + cream for any combination of almond milk, coconut milk, half and half, yogurt, anything creamy that you enjoy. 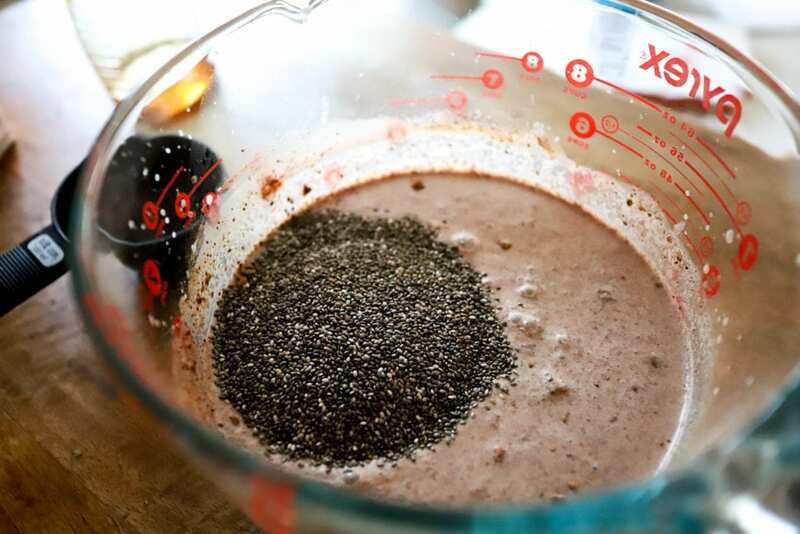 Start with all of the ingredients except for the chia seeds in a large bowl. Whisk everything to be sure there aren’t many lumps of cocoa powder left in the milk mixture and that the honey is evenly distributed. Taste the mixture to see if you’d like to add a little more honey or other sweetener – it’s up to you! 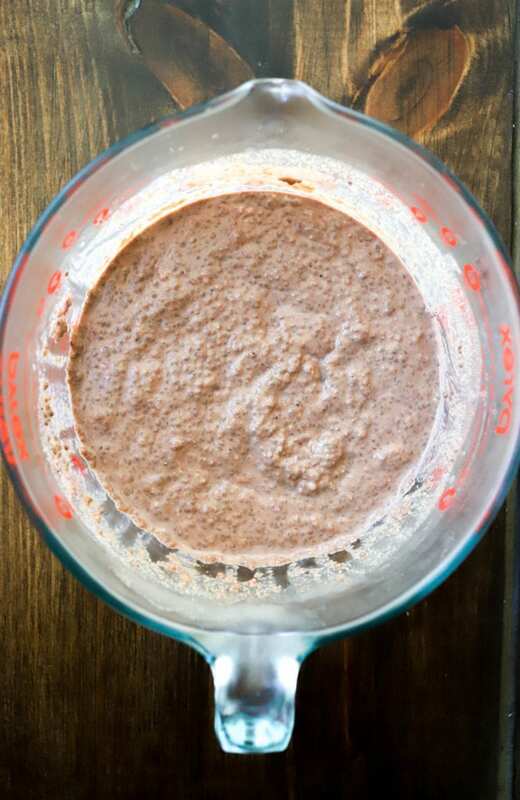 Now, stir in the chia seeds and cover the pudding to let it sit for at least several hours (I usually do overnight or even longer depending on when I want to eat this) until the pudding is thick and creamy and perfect. 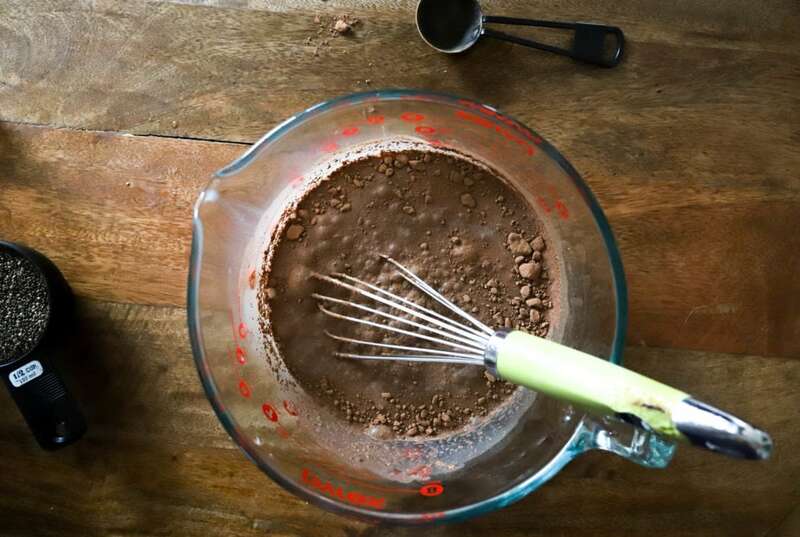 You can see that there is a little bit more, let’s say, space between the chia seeds than on thicker versions, but I love this because with the heavy cream we end up with more of a chocolate mousse effect, it’s a bit fluffy and less chewy. 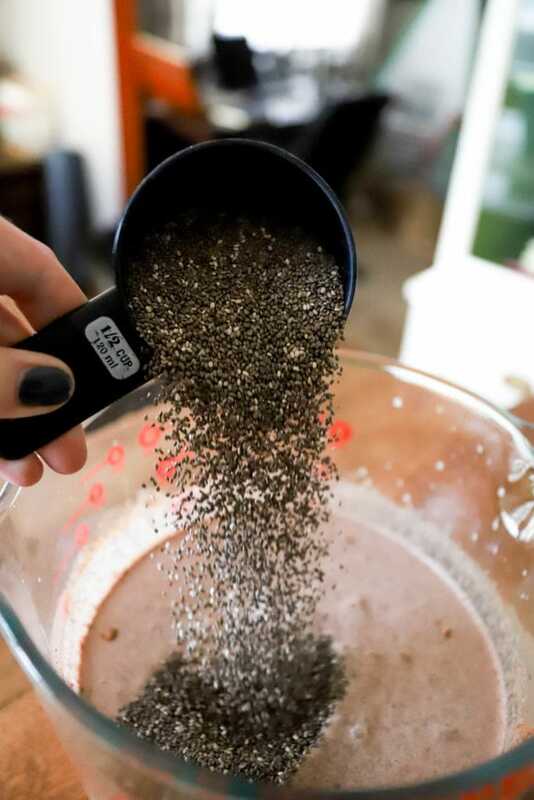 But, if you want more chia seeds, sprinkle a few more in! Now that I’m really contemplating life, though, peanut butter cups on top probably shouldn’t be optional. Enjoy this! 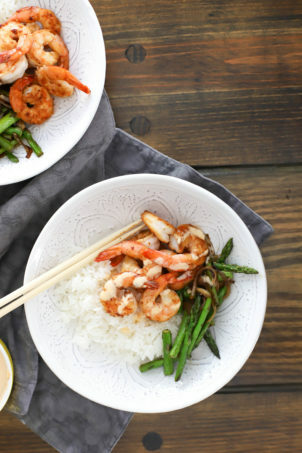 It’s a great real-food treat to keep around, and couldn’t be simpler to make. 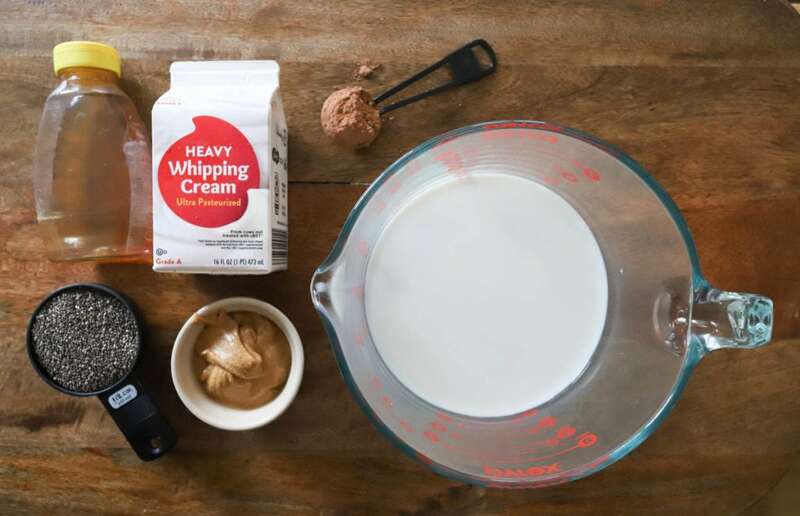 In a medium bowl, whisk together the milk, cream, cocoa powder, peanut butter, and honey until smooth and not lumpy. Taste, and add more honey if you'd like. Stir in the chia seeds and cover the bowl. 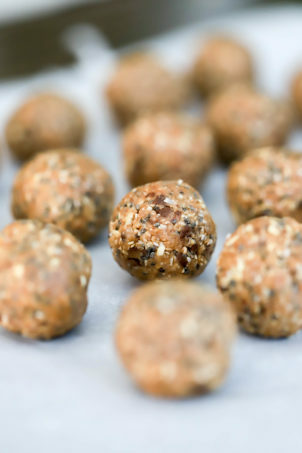 Let sit for at least 4 hours or overnight until the chia seeds have plumped. If the mixture seems thin, stir it to smooth it out and let it sit for another hour or so (if you aren't waiting overnight). 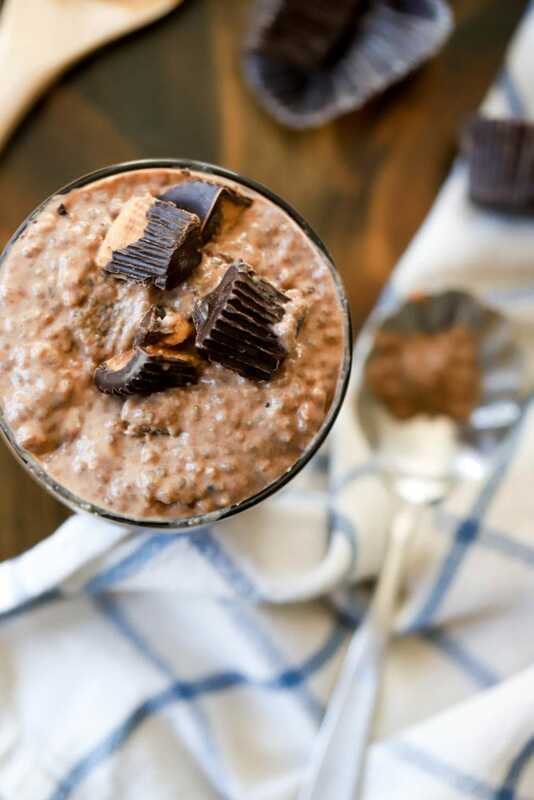 Serve the pudding topped with peanut butter cups. Enjoy! Feel free to swap out the milk and cream for any other creamy products you enjoy - as long as the total measurements stay the same the pudding will work! Almond milk, half and half, yogurt, and coconut milk all work great.